Pulling out the sartorial big guns at one of THE red carpet events of 2015 with the world premiere of Star Wars: The Force Awakens. There’s glitz, sheer I don’t hate, adorable pairings, people who aren’t in the film (but still look great nonetheless) and some after party jacket delights. Lighting up proceedings wherever she goes is Lupita Nyong’o wearing a sparkly Alexandre Vauthier couture gown. The black band across the middle kinda cuts her in two, but she’s pulling it off and continuing her red carpet reign. Daisy Ridley’s already shown that she’s not all about the simple choices and this white tiered Chloe number tiptoes towards a fairy tale frock without feeling too princess. Opting for a soft smoky eye and a 50s curl (seeing Carol everywhere) gives this look an edge and I’m excited to see what Ridley will wear at the London premiere tonight. This might be a Magical Fashion Unicorn situation, but I am so here for Gwendoline Christie rocking all this tulle in a custom Oscar de la Renta. Christie is always a red carpet highlight because she goes there and I am so pleased to see she has gone big for this premiere. 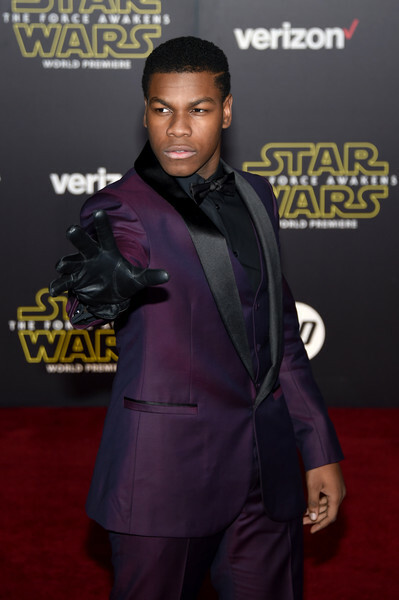 Also having fun with his look is John Boyega working a purple tux and single leather glove. An homage to Luke Skywalker? Carrie Fisher does not give any of the fucks and this press tour has been all the better because of it. Swearing up a storm and causing Billie Lourd to pull the best face on the red carpet only makes me heart Carrie Fisher more (if that is possible). Great outfit choices from both ladies. 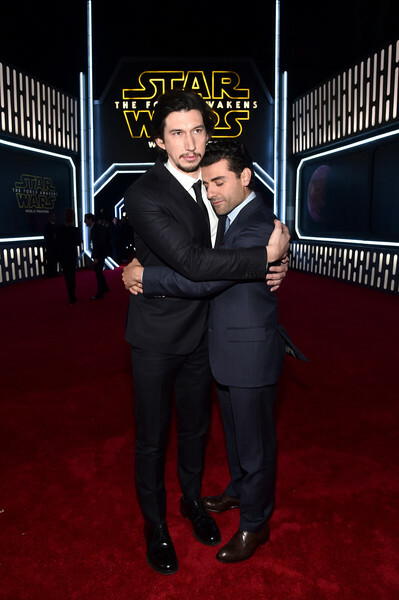 If you like Oscar Isaac being dreamy, dashing and somewhat flirtatious then this is the press tour for you (see Tumblr for all the examples). Moving into the ‘people who are not in this film, but look great’ section and these gowns choices shouldn’t be about competing/overshadowing the stars of the movie. Elizabeth Banks stays in her lane looking cool and effortless in this patterned (and pocketed!) Elie Saab frock. Newlyweds Sofia Vergara and Joe Manganiello have a post honeymoon glow (not that they don’t always look this good) and Vergara’s doing the Leia bun thing (this is the one time I wish I had longer hair so I could rock this hairstyle). Black and white lines break up the red rose pattern on Constance Zimmer’s dress and maybe the shoes are one black step too far (I think the third strap is the issue), but I like the overall idea of this ensemble. And any excuse to think about/mention UnREAL is fine by me. Back to those in the movie and the after party with excellent jacket work from Daisy Ridley and Billie Lourd. I kinda think only one of these jackets was meant for the outfit in question. Once again Lupita edges up an outfit with a jacket and here she’s gone for leather over quilted; I am so here for this choice. Plus we get a closer look at the sparkly detail of her dress. 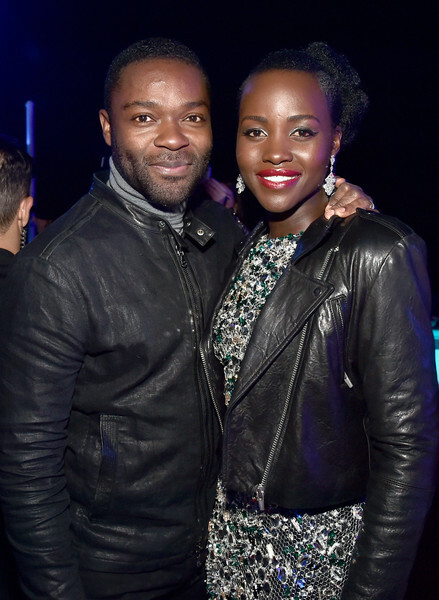 Also going for leather is David Oyelowo and yep this is really good party pairing.